Looking east from the top of Tz’u-man Mountain, the contrast between Tz’u-man Village and the city of Lijiang is clearly visible. Divided by the Qinglong River, one stands for the new and the other the old. This is a real back garden, a place of exile, a place to seek refuge, a place for the recluse. Here is a living, breathing specimen of history and nature— on this piece of land, a complex mixture of past and present, a Naxi Village where a movement in words and language is now taking place. Several artists who live and work in Beijing and Kunming received an invitation from He Wenzhao, the organizer of the Artist In Transit Project, to stay in his hometown of Tz’u-man Village from mid June to late July. The village is situated less than two kilometers from the more famous city of Lijiang. Here, to be “in transit” means “to pass by.” For these artists, Tz’u-man Village is merely a stop on a longer journey, rather than a final destination. As opposed to the concept of an artist residence, these passers-by did not depend on the local ecosystem for support; instead, dialogue is based on the experience of the physical and transient self, as are any questions raised. He set up the basic premises of the game, asking the artists to conduct their cross-border exercises over three to seven days or a maximum of ten days. They were to investigate the village’s history and current issues and submit a plan which they were to execute either on- or off-site, provided they return in October and collectively exhibit their works. And so these passers-by, who were planning to fly south for the summer break, were snatched from the air, one after another, by He, and subsequently tossed into the strange and complex reality that is Tz’u-man Village. Tz’u-man Village was a key post on the ancient tea route and the earliest settlement of the indigenous Naxi people. Today the largest unspoiled village in the Lijiang dam area, the village, under the onslaught of regional tourism development, has become another prototypical conflict point in the rapid urbanization movement: the Qinglong River can no longer serve its function to irrigate nearby farmlands as manmade changes to the river in the name of tourism have destroyed the ecosystem on either bank, effectively extending the river’s dry season; the highway bridge connecting Dali and Lijiang has divided the village down the middle and the unfinished construction carries on day and night overhead, becoming something of a permanent fixture; the local culture and customs are commodified and sold to visitors, eroding any sense of tradition and belonging and driving the local youth ever further from their ethnic and agricultural heritage. This land, which once gave birth to so many beautiful songs and tales, modernized overnight thanks to the onslaught of the internet. These rapid changes, brought about by unsolicited but overwhelming outside forces, leave no time for locals to ponder the future of this land. Should the village sell its farmland and merge into Lijiang’s urban-rural fringe? Or should it survive on tourism and develop like the other historical towns, opening guest lodging and agricultural experience motels? He Wenzhao hopes to find the answer. In 2008, He Wenzhao returned to Tz’u-man looking to publish Village Autobiography. In addition to researching the local climate, geology, botany, zoology, and hydrology, he had also mobilized elderly and middle-aged villagers, as well as those with free time, to write about their respective family histories. Each personal history was then collected into pamphlets, which were then assembled into a collective memoir, helping to tell the story of the village. Various reasons led to the temporary suspension of this effort, and five or six of the elderly villagers who contributed to the effort have already passed away. He Wenzhao feels a deep sense of urgency. In the planning of the “In Transit Project,” he hopes to relaunch a platform through the language of art, on which the local, earthy, modern, traditional, and conflict may be brought under a broader light to be studied and discussed. Ultimately, his is a search for the interactive possibility of dialogue between the village’s true identity and external forces. He Wenzhao brings people from different situations to the village and asks them to interact with the locals, carefully reviewing the struggles that each faces. The first visitor, Chu Yun, has traditionally created art based on urban experiences. In his view, any description of Tz’u-man will be interesting, and this “interesting” is the very manifestation of our innate curiosity for novelty, which is the basis of Chu’s problem. He has not selected a definite role with which to partake in this “transit,” instead choosing to skimp through on a superficial level and assemble all the images he recorded through the process as his final submission. 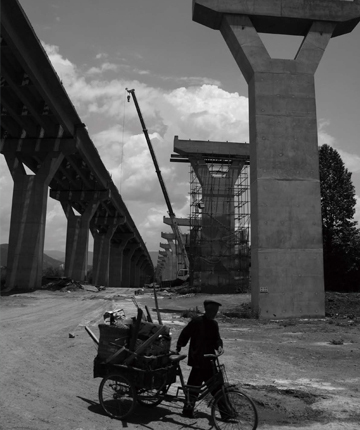 In the post-production, Chu Yun abandoned his subjective yearning to furnish the imagery; instead he imported the photos into iPhoto and allowed the program to automatically create a lengthy slideshow, granting his Mac full control. The final work lacks a story; instead, it provides an arena for the imagination. Chu leads the viewer through the flamboyance of the journey and leads them to the realities of his very existence. He does not generate the artwork using local subjects, thereby reducing his work to a mere introduction and representation of another culture. Jiang Pengyi also chose a somewhat distant form to establish a relationship with the village. His recently finished work Intermittence grew out of his innate curiosity. The title came from the first words he read during his first research trip (the word he originally read, xuduan, is the name of an herbal medicine used in the southwestern area— also the characters for the title Intermittence in reverse). This sensation of “first sight” was sustained through the creative process after Jiang returned to Beijing for post-production. The ten days of shooting in the village witnessed the desensitization to his previous experiences. As the excitement from the new environment was slowly overtaken by exhaustion, he could only mechanically observe his surroundings through the viewfinder. He Wenzhao, who acts as his guide and translator, purposely remained quiet so as to keep Jiang incommunicado. On the fourth day, Jiang noticed several old women huddled in the mahjongg room listening to tapes of old folksongs, among whom was a singer named Li Yanju. She had lost herself in the songs, and was unperturbed by the stranger who had just barged into the room. This had moved Jiang very much, and over the subsequent days he shadowed Li, attempting to overcome his own mutism with her assistance. 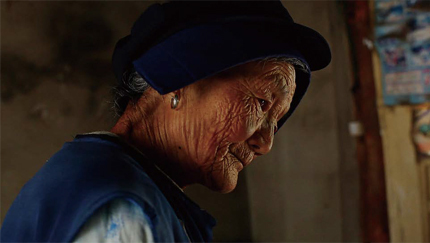 Ultimately, Jiang magnifies the life of the Naxi elderly using his HD camera, deconstructing daily routines into digestible steps and movements, forming a story of multiple narratives against abstract imagery. In his video, the clouds that were just hugging Mount Yulong dissipate like the curtains before a play; the fire that dances in the ancestral halls casts ghostly shadows; Lijiang’s romance, marinated in alcoholic spirits, dissolves into the reflection of the neon lights in the river. Jiang Pengyi, Intermittence, 2012, single channel video, color, sound, 25 min. 26 sec. Ye Yongqing and He Chongyue are the two artists with the richest experience working in rural areas. However, that very experience sabotages some of the excitement inherent in “In Transit.” In recent years, they travel between Yunnan and Beijing with the frequency of migratory birds, making the project seem more like revisiting an old exam to Ye Yongqing. He Chongyue, on the other hand, extended his interest in the nation-wide family planning campaign and the resulting empty villages to Tz’u-man. The artist attempted to photograph the entire village using a large-format camera (200 families, nearly 1,000 people all together). Due to miscommunications in the preparation stage, some of the villagers arrived two hours early, and some left in impatience. He Wenzhao and his family and friends had to go to each home individually to appease the villagers and bring them back to the shoot. Although the entire process took nearly three hours, they managed to bring together more than 200 villagers. All the elderly got into their formal garments reserved only for the most important occasions, creating a festive and spectacular atmosphere. Whether the traditions passed from generation to generation can control the steps of rapid urbanization, or at least survive its onslaught, seems to be the underlying message hidden behind the festivities. Ye Funa is the only female artist participating in the project. She also happens to be the youngest one. She spent her restless formative years in Kunming and subsequently moved out of Yunnan. This project marks her reconnection with her roots. Her interest is different from the other artists, who focus more on the past or on the urban-rural chasm. She directs her attention to those of her own age in the village, making up for a gap in He Wenzhao’s vision. Among the 25 randomly selected youths aged between 16 and 30 that she interviewed, few have left their homes. Most of them began working after graduating from vocational high schools. Some work in the Lijiang bars as waitstaff, while others make a living selling things from the village to the new town. They are satisfied with their current lives. Even those studying in university in Kunming yearn to return to Lijiang. There are no secrets among the villagers. They all know about each other and share a common value system. If it were not for outsiders, there would not be any ripples in their otherwise mundane lives. However, the younger generation has little connection with the land they live on. Even though they realize the consequences of losing their land, they no longer maintain a living by agrarian means. Their attitude towards landsale is driven by the size of their compensation. Like their urban counterparts, these young people abhor traditional holidays (none of them likes to don traditional garments) and enjoy the monotonous entertainment afforded to them by modern technology. The young men enjoy drinking, playing card games, fishing, and soccer, while the young women like the slow dancing bars in the cities. If they are to start dancing out of joy, the dance is not likely to be a traditional one. He Libin and Zhang Yu, themselves both of Naxi origin, remained in their schools to teach upon graduation. He Libin teaches at Yunnan Arts University in Kunming, while Zhang Yu works at the Central Academy of Fine Arts, in the Department of Experimental Art. In Transit to them is a return to their roots. Without the unease brought about by a foreign environment, the two artists share He Wenzhao’s sense of urgency. In the project, He Libin’s longing for his hometown became a most direct expression. He fell in love with the ethereal experiences obtained from his natural surroundings. His art, therefore, exhibits a poetic extension of his physical sufferings: on a walk from the Qinglong to the bridge, he picks up and carries branches along the way, until they overload him and “plant” him on the bridge— and then he connects his thoughts, by way of blue threads, to the ecological elements of the river (the water, the trees, the banks), away from his body and against the current, where the river is intersected by the high bridge, marking a visible end to his nostalgia. 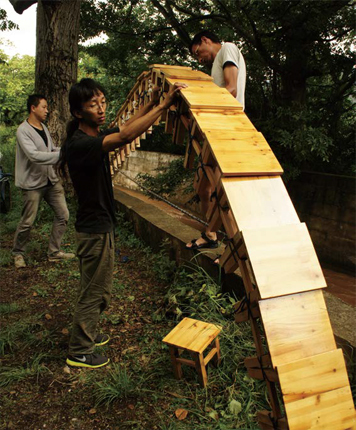 Bridge, by Zhang Yu, creates a narrow bridge spanning 4.2 meters of water using 27 square stools borrowed from Tz’u-man’s Association of Elders. He Wenzhao sees Zhang Yu as someone who is truly able to assume a modern mentality. Zhang Yu chose a section of the Qinglong that has a full variety of scenery and built a temporary bridge using 27 square stools that he borrowed from Tz’u-man’s Association of Elders. This bridge, 4.2 meters in length, was not reinforced in any way, and two days after its completion on July 15, it was sabotaged and pushed over by a curious passer-by. During the implementation process, many villagers and onlookers understood and volunteered to help with the effort. After the temporary bridge fell, some planned to build a permanent one in its stead. From the artist’s invitation to the villagers’ self-induced reconstruction, the bridge has become a symbol of unity and care. Phase one of In Transit was completed at the end of July, through which we may observe the partial accomplishments of He Wenzhao and the artists he recruited. For most of the participating artists, the brief experience at Tz’u-man is disconnected from their daily lives. Without He acting as an intermediary to translate the issues faced by the villagers, the Tz’uman experience would not have been unique in any way. It would have appeared like any other pre-packaged experiment, much like a wedding celebration or a baby shower. What “In Transit” must be wary of is “ethnological” pursuit. Too many artists have come to Yunnan for such inspiration already, thinking that this is a platform for artistic experimentation, replacing real experiences with imaginations backed by methodology, and exporting largely canned responses to whatever it is they thought they experienced. The “In Transit Project” is an experiment that involves both the physical body and the emotions that course throughout the body. It is not the recycling of the old formula whereby artists submit creations and the curator works to create a summary. The danger in this experiment lies with the bridge and the river, with the artist that visits but then leaves, with the juxtaposition of the visiting scholar and the local proletariat farmer. The culmination of “In Transit” must be examined over time, though from what we see at present, it has accomplished more than just basic education. It poses the challenge to the artist to rise above the consumerism that abounds, to maintain independence both artistically and politically, and to provide effective feedback after having passed through here. 3. Proactive engagement, rather than looking into the future with impotence and ignorance. In this way, he may empower the village to break out of the dual shackles of political and commercial interests that hold it down, to take on its own consciousness and grow in strength.